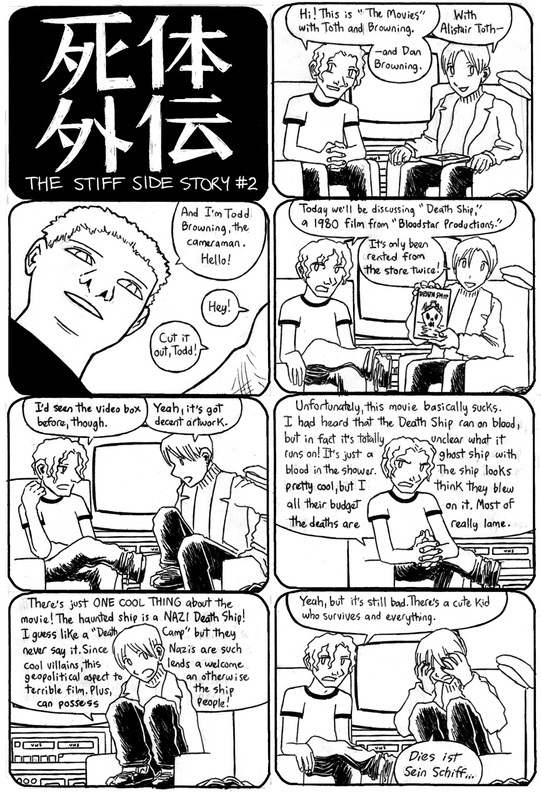 …and at long last, a NEW (sort of) page of “The Stiff”! This is part of the Stiff Side Story sequences, as recorded on handheld VHS by Dan Browning and Alistair Toth. In this week’s installment, they review the 1980 movie Death Ship. That video box art looks awfully familiar. Wasn’t there a similar nautical horror movie called “Ghost Ship” or something like that which came out not too long ago? Yay!!!! “The Stiff” is back (sort of)! “This is HIS ship…” Anyway, while both covers use a skull motif their treatment of it is quite different.